Readers, my Stitch-Along at the STC Craft blog starts this week! This week we're talking about quilting. 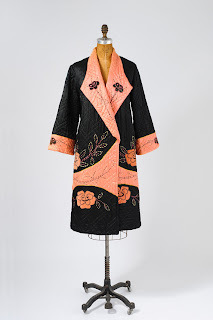 To get us in the mood, I've been researching quilted vintage garments, and there's a world of inspiration out there. 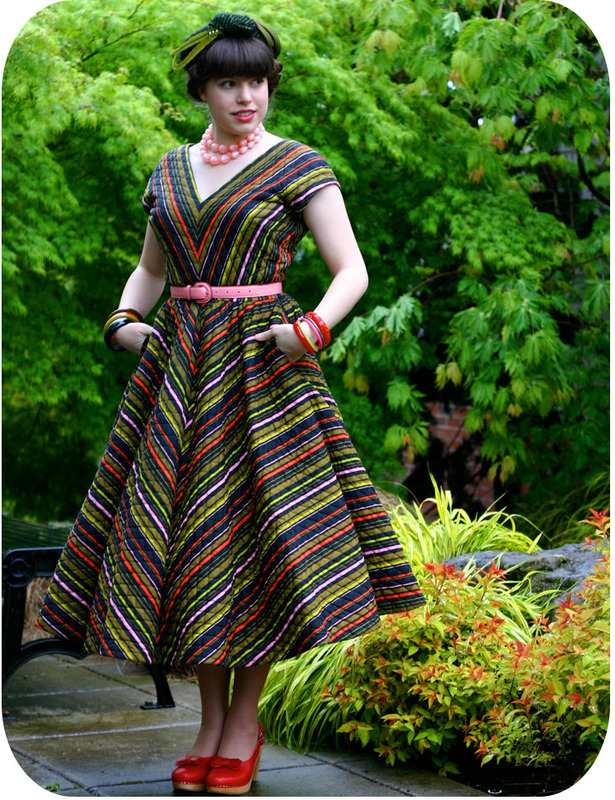 One of my very favorites is this Anne Fogarty dress as modeled by the lovely Solanah. For a modern take, there's this Zac Posen dress which has lovely channel-stitched quilting around the neckline. 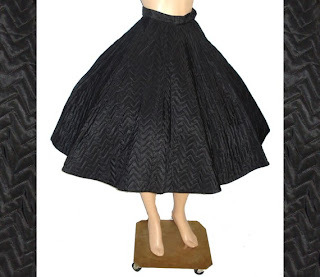 And how about the lovely zigzag quilting on this 50s taffeta circle skirt? 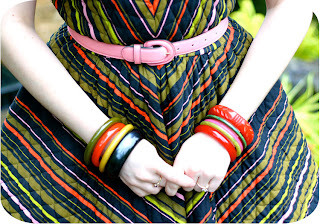 This circle skirt is much more whimsical in its use of stripes, quilting, and trims. Of course, one of the most traditional ways to use quilting in a garment is in a house coat, bed jacket, or robe. 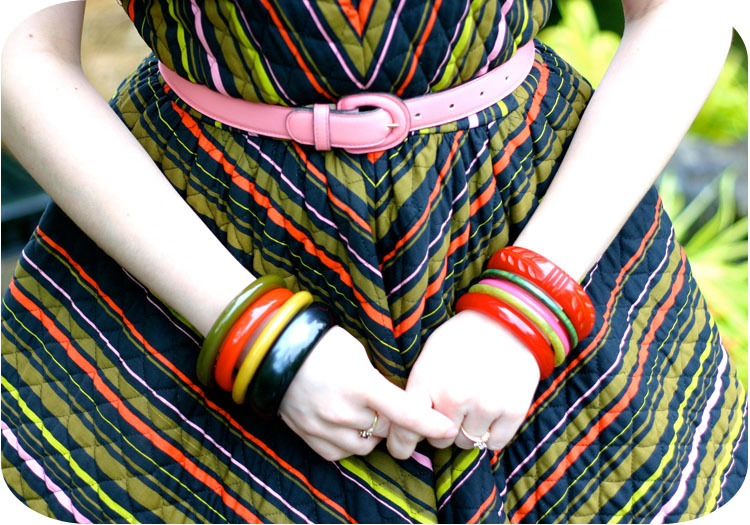 There are so many ways you can use quliting in garments! All over, or just a little accent. Hope to see you stitching-along this week. For this week's exercise, you'll just need some cotton fabric, thin quilting batting, and embroidery floss. Wow wow wow Gertie, I am definitely in for the STC Gertie´s stitch along! The red dress, the black and the red skirts have certainly convinced me. It will be my first stitch (sew) along and I am very excited. Now, what sort of embroidery floss should I get, I just don´t know much about embroidery? Although I'm not too much of a fan of the colours in the first dress, the whole thing is absolutely gorgeous!! I'd guess that the quilting would make the dress a lot sturdier than just the fabric? Makes for an interesting alternative for a petticoat! Sai, regular six-strand embroidery floss is fine. The DMC stuff you can get at any craft store. Hello Gertie, This is my first comment on your blog. First reading is really interesting. 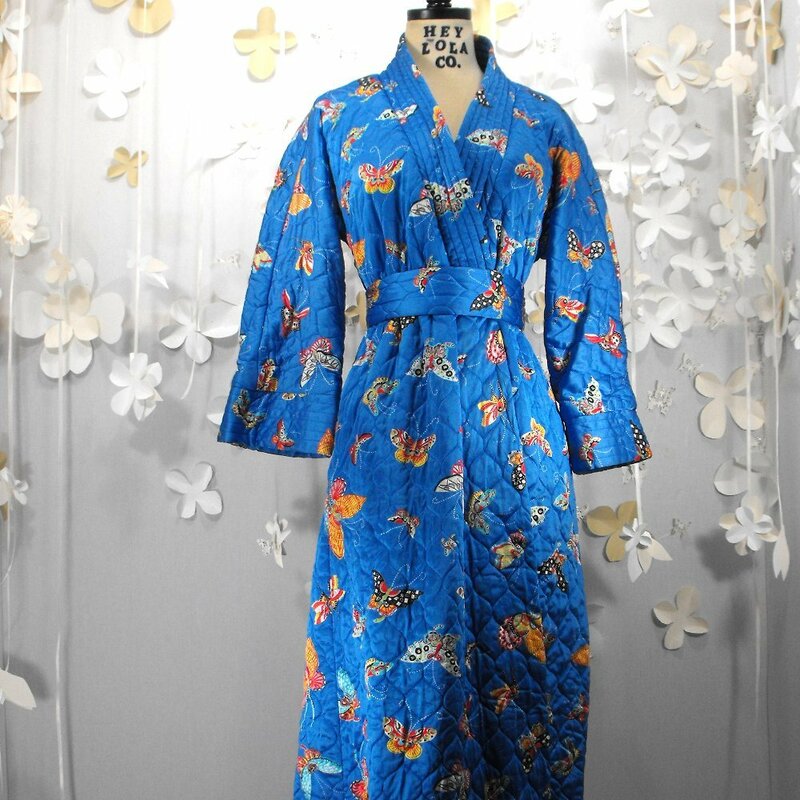 I want to learn sewing and come in to sewing industry where I can make very interesting and fancy dresses for men and women. I am from India. Can you help me for same? How can I quick start with my goal? 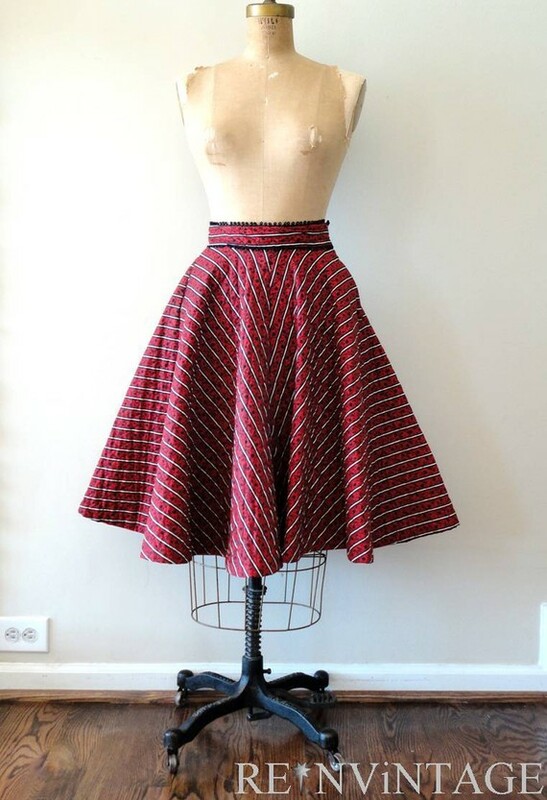 What is best place to learn sewing? Or best tutorials where I can learn at my own with such good videos. Thanks again!! I am waiting for your prompt reply. Not least forgetting the quilted haute couture Chanel jacket! But I would have never thought to quilt a circle skirt or day dress! 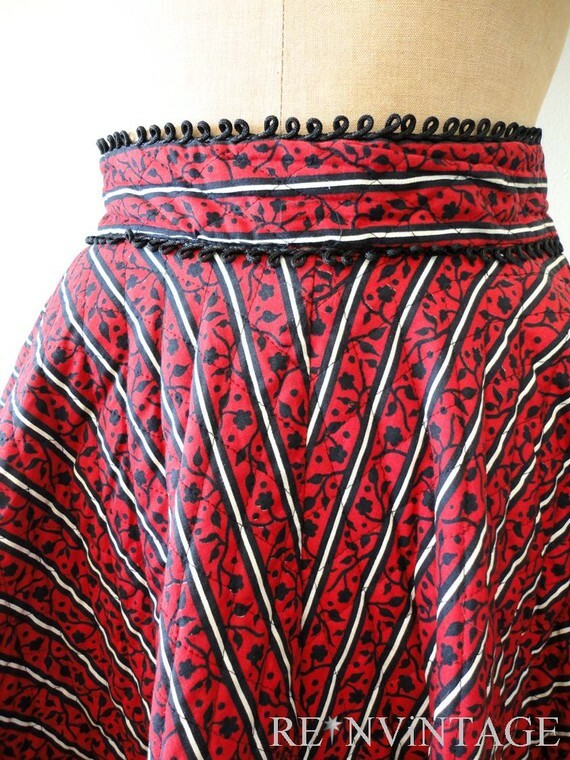 This another technique (like shirring and smocking) that I have often fancied doing but never get round to trying... Look forward to seeing your results. 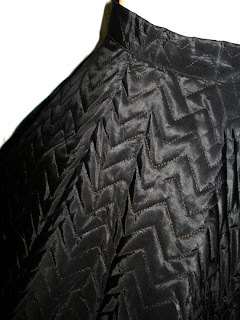 great and inspiring collection of quilted garments! What great inspiration! I'm in love with the first dress. Now, I'm thinking about how I can schedule this stitch-along in my schedule. I'm in for the stitch along, of course :-) The quilted clothes are an interesting twist - I'd never have thought it could be a pretty combination. I think I'd have liked the first dress you featured better without the quilting, though. 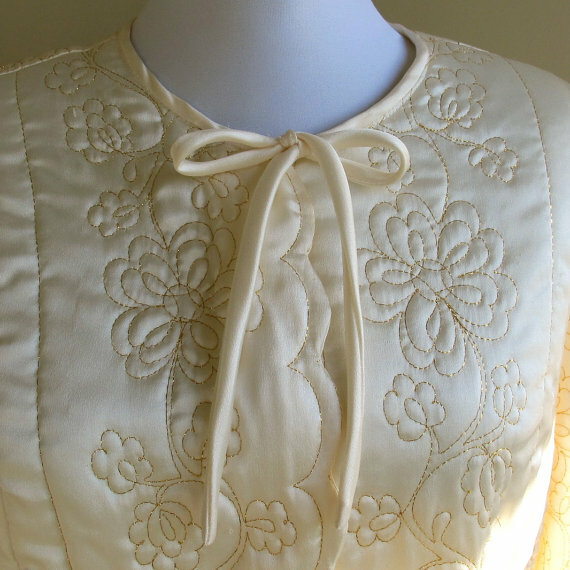 The last one, creme colored with flowery quilting, which is supposedly the most kitsch-y grandmother-y - I just loved! I'm happy to say I've got all the materials for the quilt-along at home. My batting is the fuzzy acrilan type you can find in Israel and not the sturdy thin kind, but it'll have to do... :-) I really do want to start quilting by hand - my only experience with quilting so far has been by machine. I'll be traveling a bit for the next couple of weeks, but I think the series of Stitch-alongs came about at just the right time. I can put together a little packet of sewing things to bring with me, and stitch along on the road. I won't even have to haul a sewing machine and a bolt of fabric! I am very interested to see how these techniques can be used in garments without making them too stiff or costumey. Wow, not sure I'd like to wear an allover quilted dress or skirt - seems like they'd be kinda heavy! But they are lovely. Hoping to be stitching along this week with you! While I love the quilted garments (and admire the incredible amount of handiwork that goes into making them) I can't help but think I, personally, can do without the extra bit of padding the batting adds to my already ample frame!! Bratling, we're following the book Stitch Magic, which shows hand quilting embellishment with embroidery floss for a decorative look. I'll also go over more traditional options. 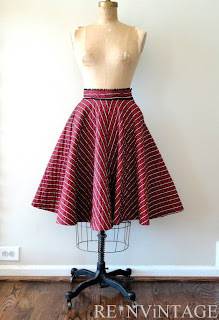 I have always been fond of the idea of wearing a French boutis circle skirt in the winter with some cozy tights so I'm looking forward to seeing how it's done! Thanks for hosting the stitch-a-long, Gertie! My favorite is the second photo. I want to have a dress like that. 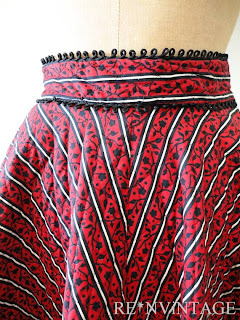 I tried to get one of the full quilted skirts in a vintage shop like 4 years ago but all of waist sizes were like a 23". 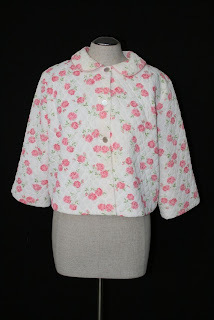 I eventually found the one I have now which is less chic and more hippie (bright yellow, little coral flowers) but I love it all the same:) Maybe I will make one in black with a chevron stitch for winter. I love a challenge! As soon as I saw the Stitch A Long announced, I ordered the book. It arrived yesterday and I'm thrilled to be able to join in on something like this! Thanks, Gertie. This is a terrific idea. Wow, I love these clothes. My favorite is the striped dress. You'd never show up in the same outfit as anyone in these!